The most recent issue of the Journal of Stained Glass (vol. 41, 2017, published 2018) was a special issue dedicated to the work and archives of the Glass House in Fulham, which was the hub of Arts and Crafts stained glass in London in the first half of the twentieth century. Primarily the work of Alan Brooks and Peter Cormack, the volume includes a transcription of their business archives and brief biographies of artists whose windows were made at the Glass House. There is much to learn from this fascinating material and the accompanying essays, and I looked through the listings to see what might illuminate my research on stained glass in Wales. One entry that stood out was a window by Patience Hallward at the little church at Arthog, near Dolgellau in Gwynedd, and as I was giving a talk on the stained glass of Dolgellau and the surrounding area, I arranged to visit the church. The window was one of two stained glass windows at the church dated, but unattributed, in The Buildings of Wales: Gwynedd (2009). Arts and Crafts stained glass is often associated with colourful and emotive original artistry and imagery, but the business archives are a reminder that the practicalities of earning a living as a stained glass artist can be rather more mundane. Among the listings for the one of the foremost artists of the medium, Margaret Chilton, are entries for the Marble Hall in City Hall, Cardiff, and the plain glazing of the Church of the Holy Spirit, Ewloe, which were commissions for restorations and repairs, and not original works. The window by Patience Hallward at Arthog is a relatively simple memorial window, with the dedication at the centre of the design. It is beautifully executed, with flowers and sheaves of wheat for decoration, and the lovely textured quality to the glass is typical of an interest in materials that characterised the Art and Crafts Movement. The artist had moved to Arthog with her father, Reginald Hallward, who was also an artist and also designed stained glass, so she would have been a local artist to the church in 1952 when the window was made. The east window at Arthog is also quite unusual. 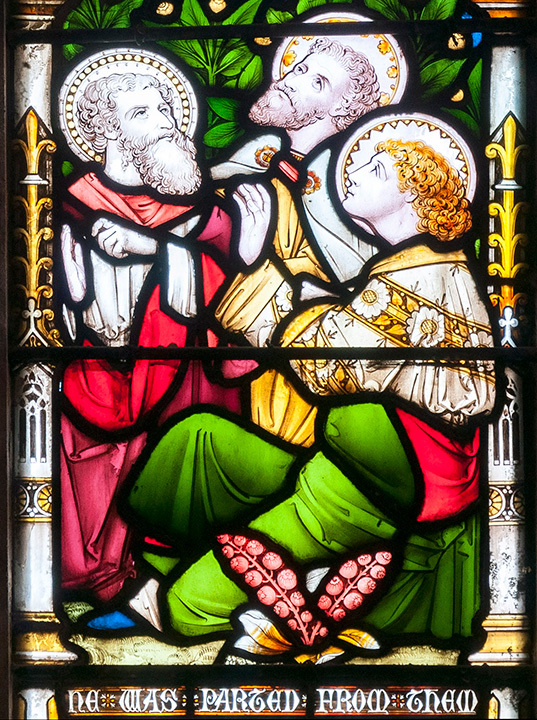 The three-light window depicts the Annunciation to the Shepherds, but the scene is executed in white glass, with a single piece of pale blue glass used in the lower part of the scene to the left. The detail is provided by paint and silver stain, but the effect is rather monochrome. It reminded me of a series of monochrome windows that I came across relatively recently at Halkyn in Flintshire, which were so unusual that I was sorry to have found them too late to include in my Stained Glass from Welsh Churches (2014). These were listed by Malcolm Seaborne in his survey of Victorian and later stained glass in Flintshire and attributed to Heaton, Butler & Bayne, part of a complete glazing scheme provided for the Church of St Mary, Halkyn, in 1878. On first sight, the east window at Arthog was also reminiscent of the work of the same firm, and I subsequently compared my photographs of the window with those at Halkyn. Not only was there a discernable similarity of style, but I discovered that the same cartoon had been used at both churches. What was different about the two versions was that the scene at Halkyn is entirely monochrome, with no silver stain. This is something that I have not seen in nineteenth-century stained glass anywhere else, although I am sure other similar windows will have been made elsewhere. I could not easily measure the width of the panels at Arthog, but it looks as though they were slightly narrower than those at Halkyn, judging by the central panel depicting the two angels. At Halkyn, the arm of the left-hand angel is raised at the edge of the panel, but at Arthog there is not sufficient room, and a hand is folded in from the left. This panel also omits the narrow border found on the right and at either side of both of the flanking panels, to accommodate both hands of the other angel, and the complete halo of the left-hand angel. This could suggest that the design at Halkyn might have been the original and the window at Arthog a reuse of the cartoon. Seaborne confidently dates the Halkyn glass to November 1878 from a newspaper report, while the Arthog window is of uncertain date, but probably early 1877 or later. It could have been made after the version at Halkyn, or the design might have predated both commissions, and adapted for use at both churches. It would be interesting to see whether the design was used for a coloured stained glass window, or whether it was reserved for largely or wholly monochrome windows as found at these churches. It was good to revisit some churches in north Wales, and see some new places in Cheshire, while acting as a guide for the Stained Glass Museum Study Weekend, alongside Jasmine Allen and Penny Hebgin-Barnes. The opportunity to see new things in familiar places, with the help of a knowledgeable and observant group of people, ensured that all of us went away with something new. In familiar churches there were some things that I had not seen before. In the case of the two churches in Buckley for instance, there were windows that were not there the last time that I visited: at St Matthew’s a new little window painted by Deborah Lowe has been added, and a window by A.L. Moore from a closed church in Manchester has found a new home in Emmanuel Church, Bistre. As the tour included churches and private chapels that I had not visited before, there were a few things in particular that I learnt from the trip, and here are three of them. 1. The work of the big studios such as Heaton, Butler and Bayne could be tremendously diverse. Well, that’s not a great start because I already knew that, but it was underlined by the work of this firm that kept cropping up at a number of the places that we visited. This seemed especially noticeable as we were fortunate to start at Eaton Hall Chapel, where the entire scheme of windows was made by the firm, but to the design of Frederic Shields, who evidently excercised considerable control over its production. 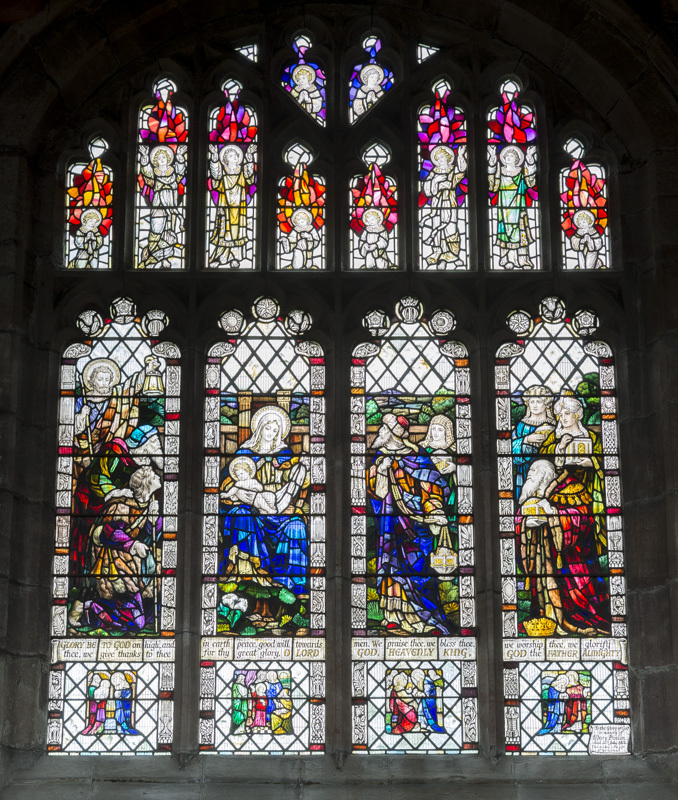 These windows bore none of the recognisable features of stained glass by the firm, and at successive churches – Rossett, Gresford, Malpas, Llanfarchell as well as at Chester Cathedral – we found their work in a wide variety of styles from the 1870s to the 1920s. Incidentally, on my return I found some similarities between a few of the poses found in the Eaton Hall Chapel glass and a window I know better, the east window at Llanbadarn Fawr, which Frederic Shields designed with J. P. Seddon and was made by Belham & Co in 1884. 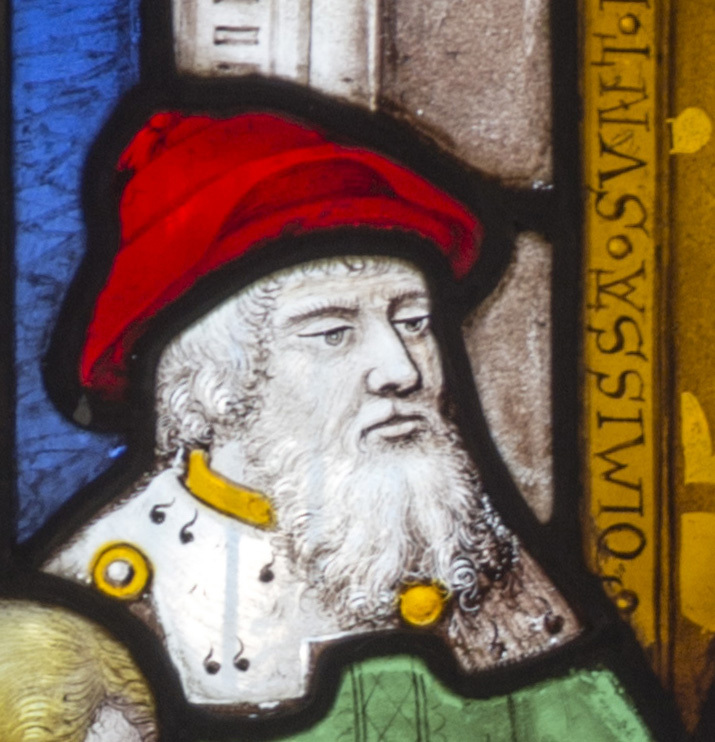 I have written about the collection of Flemish glass from the Neave collection, now at Llanwenllwyfo, Anglesey, on these pages and elsewhere. While researching the Llanwenllwyfo glass I have come across references to, and a couple of small illustrations of, the stained glass now at the private chapel of Cholmondeley Castle, so once again, although the above statement was not really new to me, the chance to see the stained glass at Cholmondeley enabled me to see this for myself and make some further observations (too many to detail fully here). 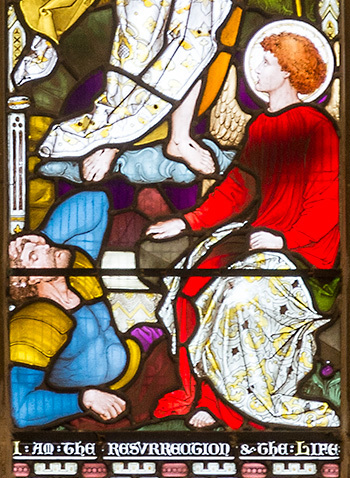 The design of six scenes now in the east window of Cholmondeley Castle Chapel is very close to some of those at Llanwenllwyfo such as Christ with Veronica, the Raising of Lazarus, Abraham Visited by Angels and David with Abigail. These were probably made in Leuven and may have come from the Charterhouse there. As well as the overall design of the panels, some of the figures are painted in a closely related style, and probably by the same workshop, and there are two examples of lettering used on the edges of garments to state the names of certain figures, found in several panels at Llanwenllwyfo. The detail illustrated here shows this and also the problems of identifying artists. 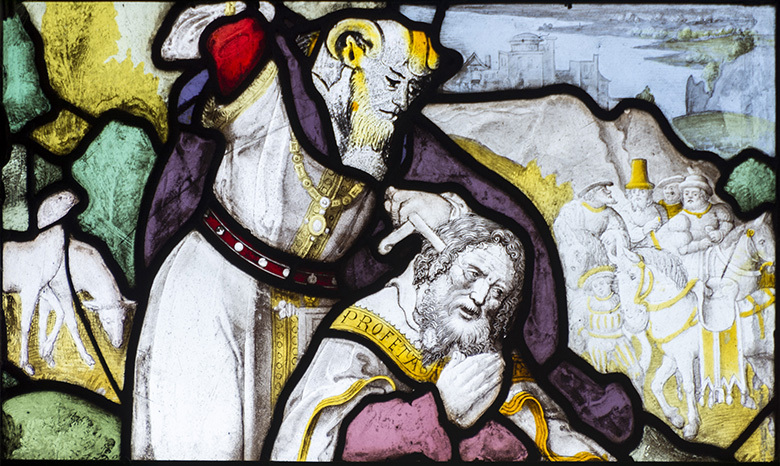 It would seem that the head of the unfortunate prophet here does not match any of those at Llanwenllwyfo closely, but it also differs from that above it and the group to the right, raising the possibility of three hands at work in this single panel. The heads of Samuel from Cholmondeley and of Simon the Pharisee at Llanwenllwyfo offer an example of a pair of heads that seem to match very closely, but not quite exactly. Since we really know very little about these panels, they could be by the same artist but separated by a number of years, by different painters in the same workshop, or the product of different workshops but closely following the work of the same designer. Whether they were originally made for the same location we will probably never know. Three of the scenes at Cholmondeley retain their lower inscriptions, which may assist with further work on their origin and the workshops responsible for them, although none have any borders at their sides. Finally, as an additional parallel to the stained glass at Llanwenllwyfo, a roundel at Cholmondeley also depicts Christ wearing a hat and holding a spade as he encounters Mary Magdalene after the Resurrection, a scene that is particularly distinctive at Llanwenllwyfo and was featured on the cover of the book about that church and its glass. Visiting the Church of St Oswald, Malpas, brought me back to a window that had struck me on my first visit, a four-light window of the Adoration of the Magi. After I first saw the window I was surprised that the Pevsner (Clare Hartwell, Matthew Hyde and Nikolaus Pevsner, The Buildings of England: Cheshire, 2011) tentatively attributed the window to Ballantine of Edinburgh. Shortly before this discovery I had also been surprised that Peter Cormack, in his review of my little book on the stained glass at Tenby, had also suggested the firm as the maker of a window that I had been unable to attribute there. Comparison of some of the faces in both windows suggests that they could perhaps have been by the same artist, although there was a little more painted shading in the little Tenby window. But were either of the windows products of the studio of Ballantine? James Ballantine & Son (also Ballantine & Allen, and later Ballantine & Gardiner and then A. Ballantine & Son) was a long-lived firm that was established in Edinburgh by the 1830s and made stained glass for the House of Lords. 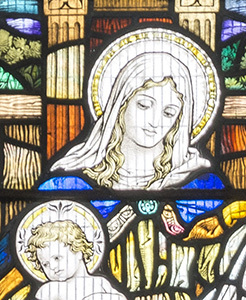 Windows by the studio of the 1850s and 60s are found in north Wales, demonstrating a strong pictorial style with very fine painting and bright colours, but, by 1881, their window at Emmanuel, Bistre shows a duller colour palette in keeping with the times. A further window of 1890 at the Church of St Mary, Lenten Pool, Denbigh, also on our tour, demonstrates a very much more conventional Gothic Revival style typical of the period. So after that recognisable change of approach, might they have embraced the Arts and Crafts Movement so convincingly that they were able to produce the beautiful window at Malpas? Many on the tour thought not, but no other attributions were forthcoming. On Saturday 1 April the ‘Cult of Saints in Wales’ project collaborated on an afternoon of talks about St Padarn and the saints of Wales at the Church of St Padarn, Llanbadarn Fawr. My short talk focussed on three south transept windows of the 1930s by Heaton, Butler & Bayne, which depicted the saints Padarn, Teilo and David. According to the Lives of all of these three saints, they journeyed to the Holy Land together, where they were met, and given gifts, by the patriarch of Jerusalem. As we were specifically remembering Padarn in the church that bears his name, I showed some more images of Padarn in other churches, but also took the opportunity to show windows of other saints by the studio of Heaton, Butler and Bayne. When looking through my archive, I found a series of images of David, patron saint of Wales, made by the firm from the late 1880s up until the one at Llanbadarn Fawr of about 1930. What is interesting about all of these figures is that even though they use more or less the same kind of figure, none that I have seen are repeats of another, using the same cartoon. This use of the same cartoon for multiple windows is of course well-known among all stained glass studios, from Hardman’s to Morris & Co. to Celtic Studios and even some of the finest individual artists in the medium, such as Christopher Whall and Karl Parsons reused designs and cartoons. 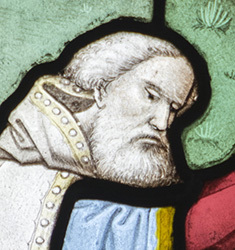 Note the range of unusual headgear provided for the saint, not a mitre in sight!